Allotment or community gardens (like the one pictured above) are a common feature of many European townships. In the United Kingdom, these are collections of small plots that can be rented for a small fee by individuals to grow food. Mostly cultivated by hobby gardeners, these patches are sites of experimentation with a variety of crops – many more varieties than a conventional, commercial farm would dare to grow! 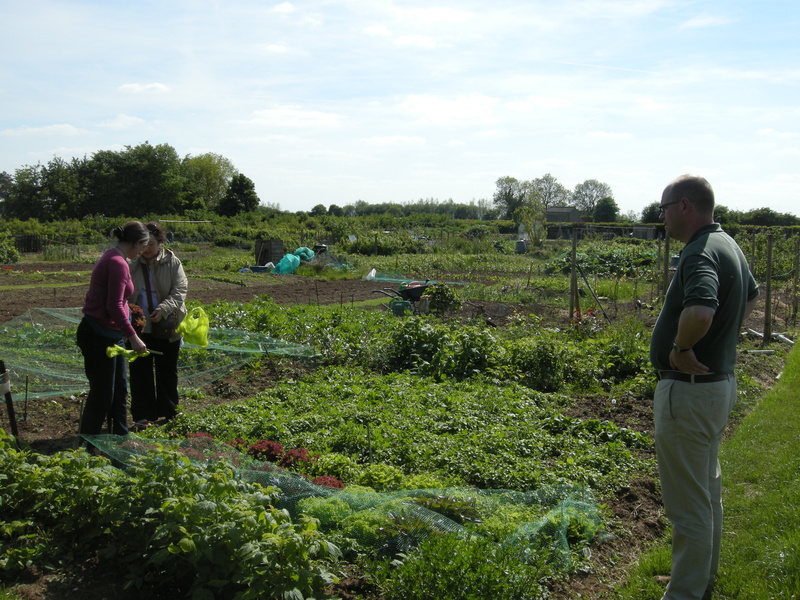 Allotments are wonderful spaces of ‘agrobiodiversity’- the sheer diversity of food crops including leafy and root vegetables, fruits and occasionally cereal grains. On the day the above picture was taken, we harvested a unique variety of curly lettuce on Robert and Didi’s allotment and made delicious salad out of it. There are other vegetables, raspberries and even a small vineyard on the plot – an impressive variety of species on a tiny piece of land in a semi-rural corner of England! Most allotment gardens are a mosaic of small plots, each very individual in its soil type, planting design and crop varieties. This inevitably means that some plots remain uncultivated at times and they can accumulate ‘weeds’ very quickly. Some of the weeds (brambles, in particular) are terribly difficult to get rid of and leave many gardeners frustrated while others are benign. Somewhat counterintuitive to the frustration with weeds, the headline of report published earlier this week in Nature says: “Weeds warrant urgent conservation”. To many conservationists, that sounds blasphemous: Weeds and conservation? No way! But this report is based on a global analysis of ‘conservation gaps‘ in wild relatives of our 29 most important crop species. There are about 455 known wild relatives of these crops and more than half of those are underrepresented in gene bank collections like the Millennium Seed Bank at the Kew Gardens. But why worry about those so-called ‘weeds’ which grow in the wild and often end up making life difficult for gardeners and farmers. Well, these weeds are the ones that have the ‘magic formula’ to grow in harsh conditions like too little water or too high temperatures (or in case of bramble, ability to send it’s tough roots so deep in the soil that without a JCB digger, the gardener has to accept defeat!). But what is remarkable about these plants is their tenacity. And this tenacity is what might help us in the future to make our crops resilient. That is why the report says we might have to turn to ‘weeds’ to make our crops stronger. If we are successful in expanding our portfolio of crops from 29 to 455, that’s a big step in making agriculture resilient. This reports has some important consequences for how we grow our food in the Anthropocene – a geological age of our own making. The Anthropocene demands innovative ways to tackle a variety of challenges and food security is one of the more serious ones. There is no doubt we need to increase production to feed a growing population, a proportion of which will also become more affluent. But the question is: can we continue to depend on the 29 crops or are we better off spreading the net wider and looking at their 455 wild relatives? These ‘wild cousins’ might well include some rowdy, unruly and rambunctious characters, but sooner or later we will have to look at their good qualities. To paraphrase Ralph Waldo Emerson, the 19th century American Transcendentalist, weeds are plants whose virtues have not yet been discovered. The challenge for us in the Anthropocene is to discover the virtues of these 455 wild cousins and feed 9 billion people by mid-21st century. “We must mine the biodiversity in seed banks to help to overcome food shortages” urges a report published in Nature earlier this month. A very sensible plea this – not least because our entire global food system is supported by a dozen plant species while there are 300,000 other flowering plants that we can potentially use as food source. A missed opportunity? Absolutely. This fragile food system is also starting to crack along the margins as recent food scandals have hinted at. Horsemeat might arguably be the only healthy ingredient in burgers (! ), but when it sneaks into our food system through the backdoor, we are extremely upset. The truth is that the supply chain of food is getting so complex that we can’t quite trace our food properly. But even more fundamental issue is: Why are there adulterants in our food in the first place? Is it because the ‘quality’ of food has to be compromised so as to supply cheap and abundant food – the hallmark of our food system – leading inevitably to overconsumption, food waste and health problems? I would rather eat the ‘Goat’s cheese and autumn olive dip and dressing’ pictured above than horsemeat-filled beef burgers! Autumn olive (Elaeagnus umbellate), an Asian native has become invasive in North America. The domestic goat is one of worst ten invasive species – a prolific grazer and browser, which has ravaged the countryside in many European countries for centuries. There is no way we can get rid of all goats overnight, nor can we get rid of plants like autumn olives. What better use for these than to make food out of them? Critiques say that by making food from invasive species, we are only going to increase the demand for them and make the problem worse. But we got to start somewhere when control and eradication measures thus far have not been successful. Making food out of invasives is a mighty good idea! 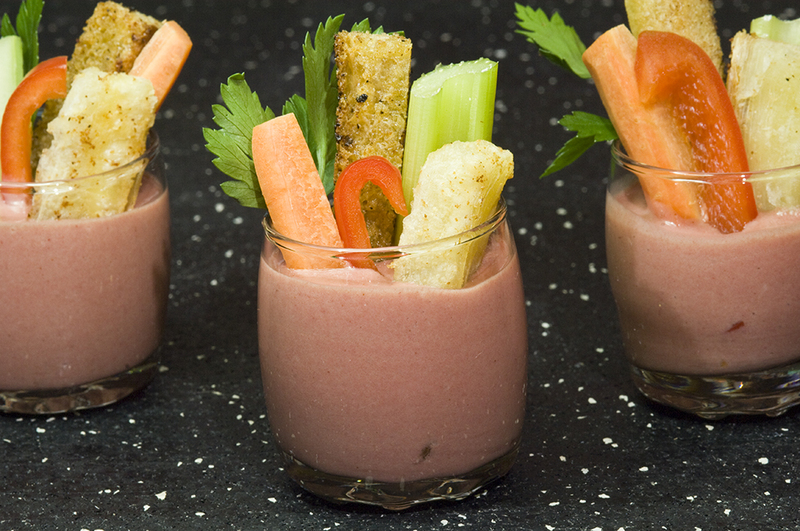 The Anthropocene cuisine might be good not only for the environment but also for the health. This extraordinary creature is tardigrade, affectionately called ‘water bear’. In reality, it is a microscopic creature and is known to be the only species able to survive in space! I took part in Open Space Research Centre’s Nature Table event last week with a number of colleagues and a fantastic guest speaker, Caspar Henderson, the author of The Book of Barely Imagined Beings and a fellow citizen of Oxford. Water bear features in Caspar’s excellent book subtitled ‘A 21st Century Bestiary’, bestiary being medieval encyclopedia of natural history – wonderfully illustrated with facts, observations and stories of wild animals. Water bear in Caspar’s book is perhaps the most celebrated example of resilience of life: even if all life on earth vanishes in a catastrophe of meteoric proportions, water bear will probably survive – a ‘polyextremophile‘ as Caspar described it. Such is the resilience also of many invasive species: they may not survive in space, but they certainly survive on earth due to their sheer adaptability to no matter what is thrown at them. One ought to admire their resilience, which also makes them extremely difficult to control. Alien invasive species cost the British Economy £1.7 billion every year, estimates the Environment Agency – that’s bigger that the GDP of some of the Caribbean nations – an impressive statistic. The Environment Agency has recently announced a new smartphone app called PlantTracker. This is a great tool for people to get involved in spotting invasive species and reporting them. This ‘citizen science’ can lead to new understanding of the geography of many invasive species. But is it enough? Can we then simply go on with business-as-usual? Or do we also need to find a different way to look at this ‘alien invasion’? It’s a tricky question, but it might be useful for us to recognize that the alien invasives have gone out of control because we have created habitat for them. Attempts to eradicate them is one way, but another is to reverse our gaze and accept that the invasives will continue to flourish alongside us. For a species of our size, we have changed the rules of the game by having a disproportionately large impact on the planet and in the process created space for other species like us. This brave new world – the Anthropocene – is beginning to be recognised. There is now even an academic journal by the same name, which usually suggests that this idea has caught on – after 13 years since the Nobel-laureate atmospheric chemist Paul Crutzen first wrote about it. In favour of ‘the Anthropocene approach’ to looking at the world, Gary Hamilton writes ‘Welcome weeds: How alien invasion could save the Earth‘ and argues that there is more good to weeds than meets the eye, while Emma Marris in her book ‘Rambunctious Garden’ argues that we should “let a little more wild” into our lives. With these new ways of looking at our natural world, something is surely changing. As Caspar described it last week, “the beginning is nigh”. How can we live with aliens? Of course, I mean alien invasive species that have spread themselves around the world hitchhiking our transport systems. Indeed, many of them have travelled far along our shipping routes. Zebra mussel is a classic example of an alien species that travelled from the Black Sea to the Great Lakes in North America in 1988. It soon became invasive in its new home and proliferated so much that it started to clog water pipes. At one point, this invasion by the alien was reported to cut off a town’s water supply! I was at the University of Oxford Botanic Garden the other day giving a public lecture ‘A brave new world: Alien invasive species and novel ecosystems’. This was to celebrate the International Day of Biological Diversity. I talked about the example of Lantana (pictured above), one of 10 worst invasive species in the world. 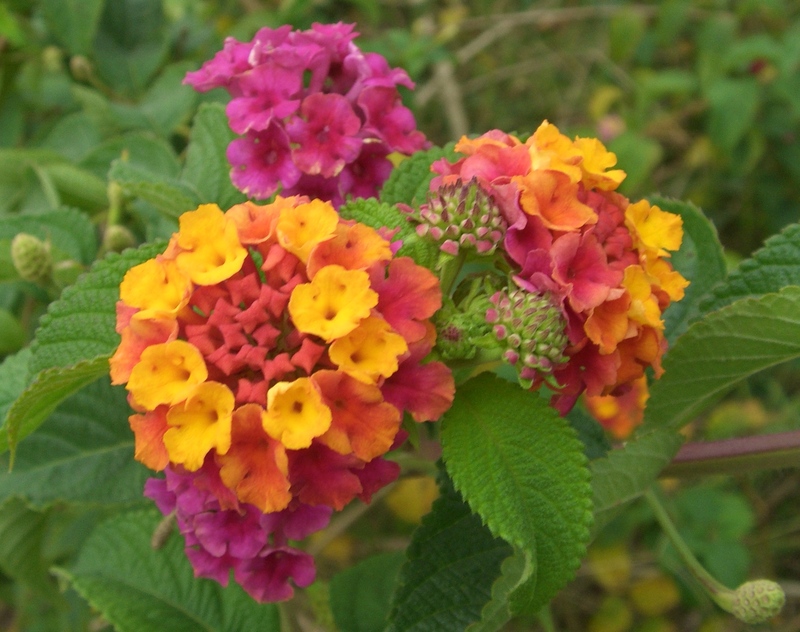 I find Lantana an absolutely admirable weed! It is a native of South America from where it was introduced in the 1800s to botanical gardens in British colonies. It really thrived in Australia, India and South Africa and after two centuries it now occupies land area as big as England on the Indian subcontinent, nearly as big as Scotland in Australia, and bigger than Wales in South Africa. There are hundreds of other species – plants and animals – that join Lantana’s league as alien invasives. They are everywhere – on land, in water and in the sea. We have tried everything to get rid of these species, but they have kept spreading. In 2009, the cost of Lantana eradication in India was estimated to be $200 per hectare. We know that Lantana is spread over 13 million hectares in India, so the total cost of Lantana eradication – if India decides to eradicate it – will come to $2.6 billion. This sum is bigger than the gross domestic product (GDP) of Maldives! The cost of eradicating Lantana in Australia and South Africa is as high if not higher and there is no guarantee that once eradicated Lantana will not return. Can we ever afford or justify spending that sort of money on eradication of alien invasive species? If we can’t afford to eradicate them, how can we live with them? Think of Lantana. It has spread over 20 million hectares just in Australia, India and South Africa. That makes it an abundant resource. Now think of tropical forests that are sacrificed to supply wood and paper to meet our needs. Could we use Lantana instead? That will solve the problem of Lantana invasion and deforestation – two birds in one stone! Eating invasive species also sounds like a compelling solution. In his book Jackson Landers reports his adventures of hunting, cooking and eating invasive alien species in North America. There are many other people who have now started to look seriously at invasive species as a source of food. So, can we address food insecurity in some parts of the world by promoting invasive species as food more widely? A report by the Food and Agriculture Organisation of the United Nations has concluded: “Eating more insects could help fight world hunger“. Of course, not all insects are invasive, but they are abundant and can provide food in much more ‘environmentally-sustainable’ manner than cattle and poultry. Arguably, that leaves out the vegetarians among us, but there are always plenty of weeds for us to eat! Ralph Waldo Emerson (1803-1882), who led the Transcendentalist movement in the mid-19th century America, once said: “What is a weed? A plant whose virtues have not yet been discovered.” That, to me, sounds like a good approach to living with aliens.